Mount Mountain is a strange name. The commentators explain that the mountain was actually a kind of double mountain, with an upper section perched upon the lower part. A mountain is the metaphor for how a personal ought to live their lives. Tall and proud, confidently present, firm with conviction, unwavering to threatening forces that surround it. That's why Moses and the Torah are connected with a 'mountain'. It isn't easy to live the life espoused by the Torah - a life of honesty, dignity, loving-kindness, discipline, and happiness. Our surroundings are filled with opposing forces which pressure us to turn to a self-centered life of greed and self-gratification. But when we feel like a mountain, we can withstand all the pressures, and live idealistically. And that's why Aharon's life was connected with a 'double mountain' which symbolizes double strength. Aharon stood for the most important mitzvah of all - Ahavat Yisroel. To love each and every person as one loves themselves. To take another person as seriously as one takes themselves. This isn't easy to fulfill. It almost feels unnatural. A little voice inside of us always reminds us about taking care of ourselves first, and about always prioritizing ourselves over anyone else. 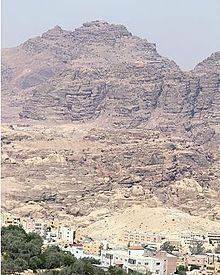 To live like Aharon, we need to feel like a double mountain. Only one who is extra confident and extremely accepting of who they are can think less about themselves and more about another.